Security Pest Control is a family owned business for over 25 years. TERMITES – Termite control services: Termite treatment, termite inspection, FHA & VA Wood Destroying Insect Inspections. FREE TERMITE QUOTES – We offer safe odorless long lasting termite control treatments with free long transferable warranties. ANTS – Fast safe carpenter ant control and black ant control treatments. BEE REMOVAL – Fast extermination of carpenter bees, wasps & hornet nest removal. SQUIRRELS – Professional squirrel removal & squirrel exclusions, expert squirrel control techniques, flying squirrel elimination & other animal control. BED BUGS – Bed bug exterminator, bed bug treatment, guaranteed complete bed bug elimination from your home, apartment or offices. EXTERMINATORS – Fast effective mice extermination, rodent control, mouse control, rat control, flea extermination & spiders. We also provide pest control services for many lesser common pest problems. Our Photo Galleries show images of common and unusual insects, along with nuisance wildlife which may be causing damage to your home or business. 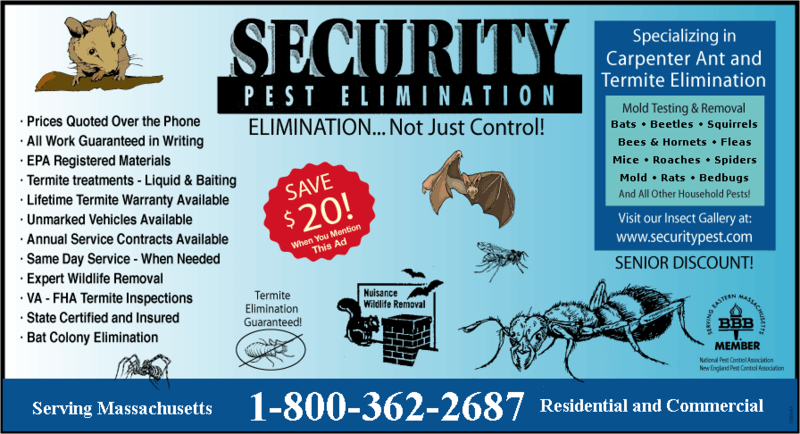 We are a licensed & fully insured Massachusetts pest control company for all of your pest control & animal control needs. We are family owned and have been providing all types of pest elimination services from ant control, bee removal, termite control to bat removal for over 25 years throughout eastern MA and Southern NH. Check out our Pest Control Services page to find out about services and programs we provide. All of our vehicles are unmarked for the privacy of our customers. Prices for most jobs can be quoted over the phone. Just before this video was taken about 500 large carpenter ants fell down onto our pest control technician’s head when he removed a piece of ceiling insulation. They crawled down inside his shirt and started biting him all over. Too bad that wasn’t caught on video. As we all know, deer ticks are a big problem in Massachusetts. Our combination of woodlands and a large deer population provide a great tick habitat. Lyme Disease is the most common tick-borne disease in North America. It is a well publicized disease and has gained national attention due to its rapid spread. The main agent of this disease is a microbe called Borrelia burgdorferi. Deer ticks can also carry the Powassan virus. Most cases of Lyme Disease in the United States are in the northeastern part of the country. The reservoir for Lyme is small mammals, specifically rodents. 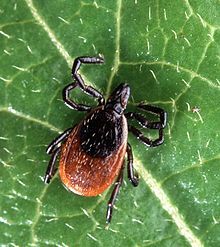 Ticks, primarily the blacklegged or deer tick, feed on deer and mice and the ticks transfer the microbe to humans. The disease does not appear to affect the deer or mice. To reduce the presence of all kinds of ticks in your yard, be sure to keep your grass cut short and use a flea and tick prevention for dogs. Our tick control prevention service is a 2 treatment program. The 1st treatment is performed during the spring/early summer to kill the newly emerging ticks while in the very small nymph stage and the second treatment is performed during late summer/fall to kill the larger adult size ticks. Ticks only become infected with the agents causing Lyme disease when they take their blood meal from an infectious animal host. Contrary to popular belief, ticks don’t become infected by feeding on deer. Deer don’t transmit the disease to ticks, although they do play a important role in a tick’s life. Instead, it’s small rodents and some common species of birds, especially white-footed mice, that pass on the bacterial agent that causes Lyme disease. Mice are active at night and live in the forest, brush, and in stone walls, and with more than 150,000 miles of stone walls in New England, that’s a lot of prime real estate. Stone walls are like rodent condominiums. The poppy-seed size nymphs emerge in May and are active through July. They wait on shaded vegetation near the ground (yard perimeters), looking for a host, most likely a small mammal or bird to latch on to. However, a human or family dog is also suitable. Nearly 25 percent of nymphs are already infected with the disease, and they are much tougher to spot than infected adult ticks. They crawl up from the ground, up our legs, and we don’t feel them. They’re hard to see. After about four days and a steady diet of blood, the engorged nymph drops from its host into the leaf litter below. The tick then molts again, and when the fall comes, adult-stage ticks, now active, wait in tall grass or brushy stems usually a foot or two above the ground looking for its host to latch on to. This is where deer come into the equation. White-tailed deer are an adult tick’s best friend. They are the main reproductive host. If no deer are around, then most likely no deer ticks will be around. The adult-stage ticks are active from October throughout the winter, as long as the ground isn’t frozen or covered with snow. However, there is some good news: In New England, where temperatures typically fall below freezing, the adult tick may be kept dormant by frigid air. A blood-engorged female – after feeding for about seven days in the fall or spring – detaches from its host and falls off; if the host is a deer, ticks fall off where ever deer may be bedded down. It survives the winter in the forest litter, and around Memorial Day, each female tick begins laying more than 1,500 eggs. That’s when the new larvae start the whole two-year cycle of the deer tick again. 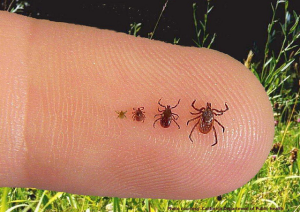 While more than half of adult stage ticks are infected with Lyme disease, they are not as dangerous as they are in the spring nymphal stage. That’s because the fall apple seed sized adults are easier to spot. The pathogen transmission from the embedded infected ticks to pets and humans begins to occur in about 24 to 36 hours.